AT&T ticker symbol: ($T) short-term AT&T Elliott Wave view suggests that the bounce to 3/13 high (37.81) ended Intermediate wave (X) bounce. Below from there, intermediate Y leg lower remains in progress as a Zigzag correction. 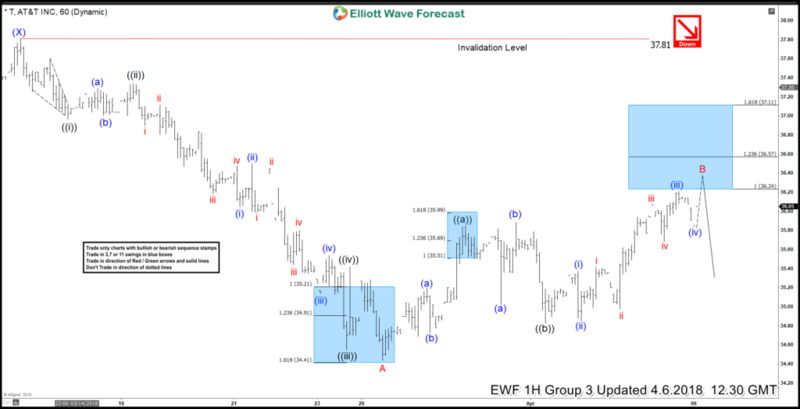 Where initial decline unfolded in 5 waves Elliott Wave Impulse Sequence with extension in Minor wave A. Which can be seen in the Chart below, with the internal distribution of each leg consisted of 5 waves structure thus it favored being impulse. Now let’s take a quick look at the short-term price action in the stock from 3/13 peak (37.81). The decline from there can be seen in 5 waves impulse sequence, where internals of each leg is consist of 5 waves structure. Where Minute wave ((i)) ended at 36.97, Minute wave ((ii)) ended at 37.34 and Minute wave ((iii)) ended at 34.55. Then from there, Minute wave ((iv)) ended at 35.29 and Minute wave ((v)) of A ended at 34.44 low. Up from there, the stock is correcting the 3/13 cycle (37.81) in Minor wave B bounce. And expected to find seller’s in 3, 7 or 11 swings as far as the pivot from 3/13 peak (37.81) stays intact. So far the bounce looks to be in 3 swings as a Flat structure, where Minute wave ((a)) ended at 35.89, Minute wave ((b)) ended at 34.84 and Minute wave ((c)) of B remains in progress towards 36.24-36.57 100%-123.6% Fibonacci extension area of ((a))-((b)). Before finding seller’s again for another extension lower ideally provided the pivot from 37.81 high remains intact. We don’t like buying it and intraday traders can look to sell it from an above-mentioned 100%-123.6% ext area for 3 wave reaction lower at least. Keep in mind that the market is dynamic and the FTSE Elliott Wave view could change in the meantime. Success in trading requires proper risk and money management as well as an understanding of Elliott Wave theory, cycle analysis, and correlation. We have developed a very good trading strategy that defines the entry. Stop loss and take profit levels with high accuracy and allows you to take a risk-free position, shortly after taking it by protecting your wallet. 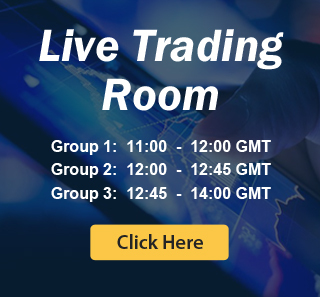 If you want to learn all about it and become a professional trader then start today with our Free 14-day trial.